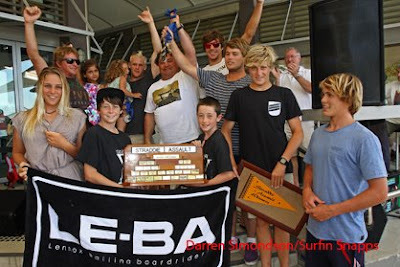 Le-Ba Boardriders wins 2011 Straddie Assault. The entire team ripped in their Saturday heats to leave the club clear winners. The club also cleaned up in the individual awards. Stu Kennedy claimed Best Maneuver and Highest Wave Score (Open Mens ) for a massive front side air reverse on his opening ride. Stephen Walsh claimed Best Tube with a sick backside pit. Steph Single claimed Highest Wave Score ( Womens ). The results for the final 4 Open heats were not announced til the Sunday presso but the Le-Ba old boys brains trust were confident enough to claim it Saturday arvo. Thanks to Stu, Marcus and Blacky for their eloquent speeches at the Presso. Congratulations to all.